Desk report: The late changes have not gone down well with Mashrafe, as it clearly shows discrepancy towards one team while not putting into consideration the extra challenges laid onto the other teams, reports The Dhaka Tribune. Bangladesh skipper Mashrafe Bin Mortaza has been irked by the last moment Asia Cup format changes to accommodate for a more lenient schedule for defending champions India. Initially, the two groups – A and B – were designated to have a group champion (A1 or B1) and a group runner-up (A2 or B2). But recently, to ensure India play all of their games in Dubai and don’t have to travel to the tournament’s other venue in Abu Dhabi. This means that India – who defeated Hong Kong on Tuesday by 26 runs – have been made A1 from group A while Pakistan – who also defeated Hong Kong by a massive margin – have been made A2, regardless of who tops the table as Group A champion in the hotly anticipated India-Pakistan encounter today. And for group B, this means that Bangladesh have been made B2 while Afghanistan are B1 – as they have both defeated Sri Lanka by big margins and ensured qualification to the next round – making their clash on Thursday a dead-rubber. 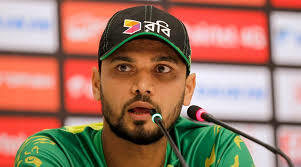 The late changes have not gone down well with Mashrafe, as it clearly shows discrepancy towards one team while not putting into consideration the extra challenges laid onto the other teams. The packed fixtures of the Asia Cup have already come under scrutiny given some teams are having to play ODI’s in consecutive days under the searing heat of the middle-east with fans and players all expressing their displeasure over such haphazard planning.